The front seats are equipped with automatic seat belt tensioners to enhance safety. 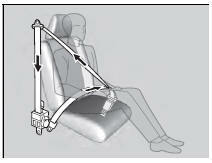 The tensioners automatically tighten the front seat belts during a moderate-tosevere frontal collision, sometimes even if the collision is not severe enough to inflate the front airbags. The seat belt tensioners can only operate once. If a tensioner is activated, the SRS indicator will come on. Have a dealer replace the tensioner and thoroughly inspect the seat belt system as it may not offer protection in a subsequent crash. During a moderate-to-severe side impact, the tensioner on that side of the vehicle also activates.